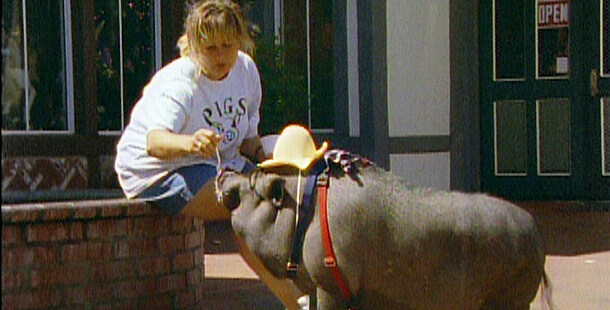 More and more Americans are keeping pet pigs. As potbellied pigs Maynard and Cecil demonstrate on The Joy of Pigs, some pigs are more welcome in the house than in the barn. These two have the run of their owner’s Beverly Hills home, and are just like any other household pet — if a little rounder. Maynard enjoys the lap of luxury. But if an owner keeps a close watch on a pig’s eating habits, a potbellied pig should end up weighing no more than a relatively sane 100 to 150 pounds. Pig breeders are now trying to create smaller versions of potbellied pigs, about the size of small dogs, called “miniature pigs” or “micro-pigs.” More suitable for apartment living, these pigs should be less of a burden to owners, who often are not prepared for a pig’s girth, eating habits, and sometimes unmanageable behavior. Some owners do become disenchanted with their pets and abandon them at shelters. That’s where Suzie Parkinson and her ranch, L’il Orphan Hammies, come into the picture. As you see in The Joy of Pigs, Parkinson lives on her Solvang, California, ranch with more than 50 porcine companions she has rescued from shelters. Many of them are pigs who grew from babyhood to become gigantic, ravenous hogs — natural for a pig, but more than some owners bargained for in a pet. The National Committee on Potbellied Pigs provides information to potential owners. Anyone interested in adopting a potbellied pig should understand the challenges, as well as the joys, of keeping this unusual, endearing animal as a pet. Like dogs, pet pigs must go out for walks; like cats, they can learn to use a litter box. They enjoy a good scratch or a fun game of fetch, and can easily be trained. In addition, they generally get along well with other domestic animals. Pigs are instinctively wary of being picked up: in the wild, predators capture them from above and lift them through the air. However, many do enjoy lap visits and cuddling. Pigs are clean pets who will stay tidy if they are bathed and groomed. To keep them cool in hot weather, owners should provide lots of clean water for them to splash and wallow in — unless you’d rather keep a mud puddle around.